“Wild” and “isolated” were the words that always came to mind when thinking of Galapagos. A well-known place, yet with a hint of mystery to it. Normally, all you hear are stories about its unusual and endemic fauna & flora, Darwin’s evolution theory, continuous expeditions, and for me, world class waves. Stories give power to the place’s reputation, instigating you to see it all for yourself. Lost at roughly 900km/550 miles off the coast of South America, Ecuador‘s jewel is an archipelago of metamorphosis, constantly changing its environment and everything that dares to be part of it. A true and clearly visible proof of nature’s evolution. This intriguing energy and uniqueness made me highlight the islands on my Atlas book a couple of years ago, hoping to one day witness its magic with my own eyes. Little did I know back then that in April 2015 I’d be hoping on board of Kuhela (a 38ft sailboat), and together with my friend be sailing from Panama to San Cristobal Island, arriving eight days later, eager to explore this seemingly inexplorable place. Nowadays Galapagos is easily accessible by plane, with relatively pricey flights leaving daily from Quito and Guayaquil in Ecuador, to San Cristobal or Santa Cruz Islands. Sea crossing is another option to be considered, and even though it isn’t as fast and easy as flying, it is an option, and just so happened to be the one that came my way. Images I once had of Galapagos gave in to the reality in front of me, as we dropped anchor at Puerto Baquerizo Moreno on the morning of the eighth day. The place was a lot more developed than I thought, and seeing such a busy port with so many buildings on shore buried my expectations about the “wild air” . Surely enough, as we stepped on land and saw hundreds of sea lions laying around the esplanade it was clear the place hadn’t been tamed, it just became more humanized. As interesting and exceptional as it may be – a UNESCO Heritage area with more than 140 terrestrial/marine sites and nature reserves – the archipelago is somewhat super protected, for the same reason. A tricky and expensive (yet not less appealing) place to explore. Most sites of interest require you to be accompanied by a certified guide or go on a paid tour (specially marine sites). To see around you either need good old money or creativity, and since most of our budget went towards boat bureaucracy and agent fees we chose to evoke our creative selves in order to make the most of this incredible opportunity. After surfing our brains out in the first week we felt the need for some land exploring, to see what the highlands had to offer, and having heard from locals of places like El Junco (a lake on a dormant volcano crater, only fed by rainwater) was enough of a reason to venture uphill. A paved roads goes 24km, from Puerto Baquerizo Moreno (town center) all the way across to Puerto Chino beach, on the SE coast of San Cristobal. This is the only actual road on the island, and if you’re not on it means you probably trespassed into a restricted nature reserve area; not good. But by following the road you’ll not only reach El Junco at the very top, but also come across El Ceibo (a tree-house cafe), La Galapaguera de Cerro Colorado (nature reserve) and some breathtaking viewpoints, before hitting the white sand beach at Puerto Chino. A day trip can (and should) be made out of it, and for that all you need to do is pick the means of transportation. As with many situations in life, in this case you also have options for choosing how to get there. Understanding that this became a highly regarded trip amongst tourists, taxi drivers came up with their own “tour”, where they charge U$60 to take as many people as they can fit in the car (probably 4) to all the sites of interest and drive you back. Not a bad deal (considering Galapagos’ prices), and perfect for the ones who want to comfortably see every spot and spend some time chilling at the beach. But it didn’t quite fit our wish to truly emerge in the highlands, as well as exercise our sedentary sailing legs. Guided bus tours are also an option, but since we crossed off the whole “going by taxi” deal the bus choice was crossed off twice. Many customize the options, by creating a taxi-bike fusion, where they either ride all the way across and taxi back, or vice-versa. It would cost you about U$10 pp for the taxi ride, plus the bike rental for the day (U$20). This hybrid option suits the ones who don’t mind spending a bit extra if that means being able to do all the sightseeing and still manage to chill at the beach and do some exercise by bike, all in one day. In the mood for the Galapagos adventure we decided to stick with the cheapest, most demanding choice of riding 20km uphill, not knowing how steep the so called hills were. Finding a bike in San Cristobal is not hard, and thanks to the sense of community among local businesses they all have the same rates, and usually same opening times. If deciding to bike there (regardless if you’ll taxi back) consider finding a shop the day before, and maybe even reserving a bike, just so you can head off the next day as soon as they open at 9am. Our shop of choice was “El Cañon”, located on the esplanade, just before the navy base. The staff was friendly and helpful, and their bikes came with a lock, repair kit and were very reliable. A couple of twenty dollar bills got us the transportation for a full day, and after adjusting the seats we were off. As soon as you leave town center the road stretches straight ahead, slightly upwards, in an attempt of looking like a highway. This first part of the route tricks you into believing that life is easy, when you have no idea of what’s ahead. Once the road starts to bend it’s worth stopping and looking behind you, as the view overlooking Puerto Baquerizo Moreno is truly something. But remember not to stop for too long, since you have a long way to go. There’s a little (yet visible) side path you can take right before the first big turn, to avoid riding side by side with the fast going vehicles. After that just try sticking to the side of the road and you will be safe. Eventually you’ll arrive at the village of El Progresso, which is the perfect opportunity for a 10min break, either to check out El Ceibo for a coffee or devour an overpriced ice-cream from the local mini-market – the latest being our pick. After a sugar boost the adventure really starts. Windy, steep, stretches of road seem endless, and every now and again hopping of the bike to carry it up an uninviting part is both permitted and necessary. Passion fruit hanging off the bushes on the side of the road work as a reward for the perseverance, and looking to the densely green nature around definitely puts a smile on the sweaty face. With the higher altitudes come lower temperatures, and you can literally sense the place change. A remarkable temperature drop together with a more humid air and greener vegetation make you forget you’re so close to the Equator. It feels like you suddenly rode from Galapagos to Ireland, and realizing you’re on shorts and t-shirt reminds you about that nice and warm waterproof jacket you left behind. Getting rained on a few times and eating about twelve passion fruits, we finally reached El Junco, or in a more suitably and appealing name: “the top”. Looking up to the stairway that leads to the lagoon viewpoint we decided our legs could use some mercy and chose to hike up on the way back. From now on was downhill, and we were more than stoked when a taxi driver standing by his car at the parking lot told us that. We rode a few more kilometers, speeding up as much as possible on steeper descends, enjoying that almost free-fall feeling of riding a bike downhill. On the way down is definitely worth stopping when you spot a sign saying “Finca Las Gemelas”, from where you’ll have a clear 180° view of what’s down below, and if the clouds help even be able to see the Northern points of the island. At about 3pm we got to La Galapaguera Cerro Colorado and were greeted by a friendly guide, who gave us some info (in Spanish) and showed us the way. 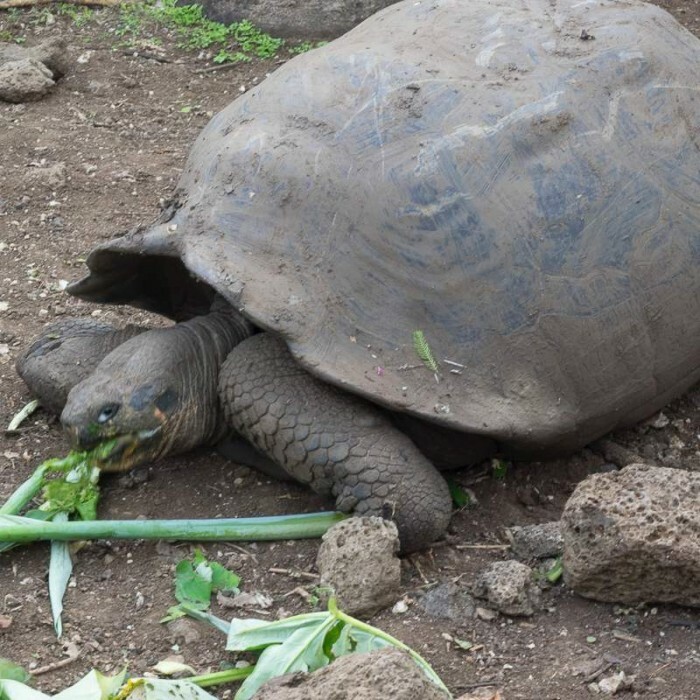 The place is a semi-natural reserve built to improve the “quality of life” of the island’s giant tortoises, creating an environment with similar conditions to their natural habitat. We only just made it in time, since depending on the season the reserve closes at either 4pm or 5pm, and you’ll probably need roughly one hour to walk around the trail. The center aims to protect freshly laid eggs by bringing them to the reserve and caring for the hatchlings until about two years old, when they’re released back into their natural habitat on the Northeast of San Cristobal. A well organized and functional initiative, engaging tourists into understanding the issue of giant tortoise endangerment. There are currently about 40 tortoises living on the reserve, ranging between 8 and 150 years old, and if you’d like to see them “in action” make sure you arrive early ’cause they eat a lot and go to sleep as soon as the bellies are full. With time against us a decision had to be made: do we keep going all the way down to Puerto Chino beach or do we start making our way back? Our watches showed just passed four, and considering how long it took us to get there, plus the fact we still had to stop at the lagoon, made us head back, this time uphill. Lucky enough a car stopped with my attempt to put the thumb up, and we scored a lift all the way up to El Junco. The sight of the stairway ahead wasn’t as daunting as before, and with the bikes locked we made our way up, step by step. Being only fed by rain makes the water levels unpredictable, and as it happened in the past, when it pours the lake sometimes overflows, pressuring the water through channels that run all the way down and flood the town center. Once more nature shows who’s in charge here. Unfortunately visibility wasn’t the best that day (as it usually isn’t), and we were too late to go on a hike around the lagoon. But just to sit there and let the moment sink in was more than enough. A certain mystic air surrounded the place, and through the deep contrast between water and surrounding vegetation you felt sheer peace. The sun was almost invisible through the clouds at such altitude, so we ran back down the steps, hopped on the bikes and sped back through the unlit road. Hitching a ride wasn’t an option anymore, and we had to accept the fact we were biking all the way back. Funny enough riding downhill was a lot easier and faster than the opposite, and we were going past El Progresso before we knew it. Just as we reached the end of the village a final rush of adrenaline hit us when getting chased by half a dozen hungry, bike-hating street dogs. Hands griping the handlebars tight, tires spinning quickly, all that left was to enjoy the evening breeze chilling our bones and smile about the sights our eyes had seen that day, as we rode back towards town, and towards a big plate of food. Since this is a bike day trip you should try not to fill up your backpack, mainly because you’ll be carrying it. You’d rather pack smart than over pack. 1. Due to the iffy weather conditions bringing a relatively warm and lightweight waterproof jacket (men, women) is a must. That will keep you warm throughout the day and save having to wear pants (women, men) or a hoodie (men, women) with a long sleeve shirt (women, men). 2. A 1L bottle of water per person and some snacks are highly advisable; you’ll probably get hungry or thirsty and will be away from any actual shops. Some pocket money would be good in case you want to treat yourself with an ice-cream or save yourself with a taxi ride back. 3. No need to mention a camera. There’s plenty to take photos of and if you happen to have a Go Pro with a head and/or chest mount or any other waterproof gadget that won’t weight you down it’d be recommendable. 4. If you’re definitely thinking of going all the way to Puerto Chino beach to spend some time chilling/swimming, then take sunscreen for face and body, hat or cap, sunglasses, boardshorts/bikini and the lightest towel. 5. Don’t forget to pack a mosquito repellent and some antibacterial wipes. 6.Light hiking boots (men, women) do the job as footwear. They won’t get in your way riding the bike and will surely help when hiking around. 7. A headlamp and/or torch with extra batteries is a valuable thing to have if going for the full “bike all the way” adventure…. There’s a good chance it’ll be dark by the time you head back. 9. Make sure your bike is well set up and has a lock and repair kit. If you end up needing it, you’ll want to have it. 10. Also pack determination, strong legs and a big smile…it will take you a long way! Photos by Kim Feldmann and Josh Knox.